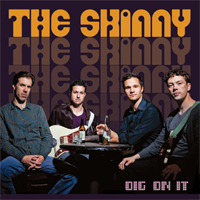 The Skinny has risen out of the fertile Chicago music scene with their debut 2012 release Dig On It (Tippin’ Records). With a heavy dollop of Crisco thrown into a simmering mix of Funk, Jazz and Blues, The Skinny know how to get things cookin’ on the front burner and keep the grooves hot without boiling over. Formed in 2005, The Skinny became a band in the wake of bassist Jake Vinsel’s inspired association with the legendary James Brown funky drummer Clyde Stubblefield. 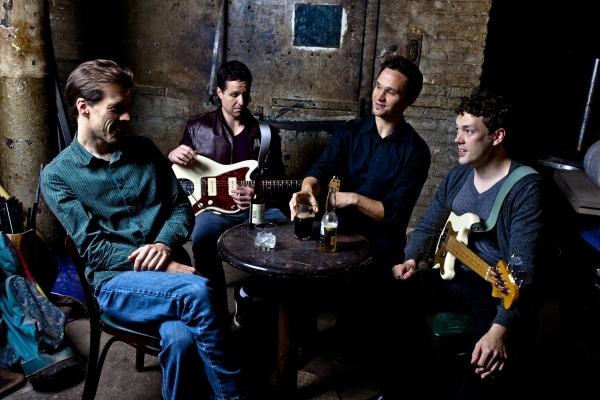 Guitarist Kyle Asche, one of the most active guitarists on Chicago’s rich Hammond Organ Trio scene, brought influence and repertoire from Grant Green, George Benson and Melvin Sparks to the band. Mike Schlick, a longtime cornerstone of Chicago’s vibrant Blues and Jazz scenes alike, came with an unmistakable “old school” backbeat as well as a deep understanding of the music of The Meters and Booker T & The MG’s. Organist Ben Paterson has been at the side of the legendary Chicago tenor Von Freeman for almost a decade. In addition to his elegant and swinging piano style, Paterson is a force to be reckoned with on the B-3 organ. As student of Chicago’s own Hammond Organ wizard Chris Foreman, Paterson absorbed much of the sound, style and repertoire of the legendary Jimmy McGriff. While many funk groups lack the harmonic sophistication of a good jazz soloist and many jazz groups fall flat when trying to play a honest backbeat, The Skinny pride themselves on being able to stand with one musical foot planted firmly in each style. A wealth of collective experience and tenure back the band’s philosophy and sound. The members of The Skinny have played with the aforementioned Von Freeman and Clyde Stubblefield as well Charles Earland, Jack McDuff, Melvin Rhyne, Red Holloway, Jimmy Johnson, Shelia Jordan, George Cables, Ray Appleton, Eric Alexander, Chris Foreman, Ira Sullivan, Bobby Broom, NOMO and numerous others. With Dig On It The Skinny make the musical statement that jazz and funk need not be mutually exclusive. All you need is the Crisco and possibly a summer afternoon to enjoy an excellent release by a band that is certain to have great things on their musical horizon.